I've finished sewing the off white hexagons to join the 7 medallions that will make up the center of my Brinton Hall quilt. The pattern by Leigh Latimore can be found in Quiltmania Magazine #107 and #108. It's published in just two parts, and my second part just arrived in my mailbox last week. I love taking floral prints and surrounding them with hexagons. Here is part of the process I will go through to decide what fabric to use for my center background. They say, "The camera doesn't lie." So I take photos and study them on my computer screen. I can fit all of my choices on the screen and stand back to see just how the values read both from far away and close up and how the colors blend with each other. The corners and the top and bottom sections will be filled with scrappy hexagons. I'm getting a bit ahead of myself, but I wanted to see how the center would look against a batik fabric. 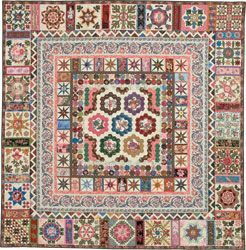 In Leigh's quilt, she used a mix of reproduction fabrics and large Kaffe Fassett prints. So I figured why not mix in a batik. When it comes time to actually sew the center to the background, I may change my mind. You are welcome to leave a comment and let me know which one you like. This batik is a teal color. This one is a brighter blue. And going a different direction, here's a rust batik. I thought I knew which one I would use until I saw the photos. Here are close up photos of the blocks. The center of this fabric is a Kaye England fabric. The center fabric above and below came from Bella Quilts in Hamilton, Ohio. It's on the outskirts of Cincinnati. When I'm in the area, I always make a point to stop there. The next two centers are from my stash. I think the one below may be a Kaye England fabric. The one below is from a Windham line called Wharton. Another fabric from my stash is used in this center. There are several versions of this Anne Brereton quilt that you can find by doing a Google search or by looking on Pinterest. The quilt below is from the book Feathering the Nest with Vintage Inspired Quilts by Brigitte Giblin. Her center is the same as the one I'm doing. She finished the outside using large hexagons. There are several quilts with hexagons in this book. The quilt below is Turkish Tiles by Kim McLean. On the Glorious Applique' blog, Kim wrote that the pattern for this quilt went to a few people she had in a class about 10 years ago. To date, I don't think the pattern has been published. 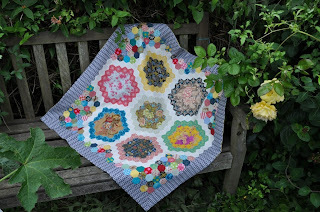 This quilt is made by Annemieke at Colours and Fabrics blog. You can see more photos of this quilt by clicking the link. I'm headed out to the porch to baste more of the scrappy hexagons for my center. I've finished machine quilting and binding this small scrap quilt. I'm on a roll. I have one more to small quilt to bind, and then I will pick something else from my UFO pile to quilt. The quilt above is made from the leftover blocks from the Little Bits quilt from the book Friendship Strips & Scraps by Edyta Sitar. Here is the full sized quilt. It is still in the UFO pile to be quilted. I'm kind of at the point where I've decided that these quilt tops and bags of blocks aren't doing anyone any good in stacks or baggies. We put a lot of work into the selection of fabric, careful cutting and piecing, not to mention the cost of the materials. In a lot of cases I've done several hours of hand work on some of these quilts. So I'm beginning to put some of these blocks together and do some quilting on others so that they can be enjoyed. At least that's the plan for now. I hope you are finding some time to do some stitching today! This post isn't quilt related or even craft related, but I went into Hobby Lobby yesterday to look around. I love their store. There are a lot of one of a kind items plus a lot of craft supplies. This is what I saw. I could hardly believe it, so I snapped a few photos with my phone. Notice the pumpkins next to the Christmas trees. Yesterday was July 21! It looks like they had just finished stocking the shelves. I guess this is truly one stop shopping. You can get your Halloween and Christmas decorations all at once, and be ready for both way ahead of time. I began and finished this hexagon quilt in the last month. My friend from our EPP Addiction Group, Michele, had a magazine with this quilt design in it. Since the magazine is no longer available, I took a photo of the quilt to make the wall hanging. It measures approximately 34" square. The hexagons are 1 inch. I have always done needle turn applique' and enjoy it. But, after chatting with Michele, I decided to try my hand at machine applique' on this quilt. She told me to press the hexagons with the papers in, then take the papers out and press again. Then I glued the hexagons onto my backing with a dab of Elmer's washable Clear School Glue just at a few intersections between hexagons. I pressed again to help dry the glue, and then I used spray starch and pressed once again. 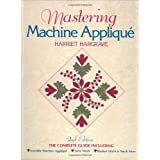 The book Mastering Machine Applique' by Harriet Hargrave has wonderful directions on how to set up your home machine to machine applique'. Now I'm looking for other UFOs that I can machine applique'. I machine quilted this on my home machine (Bernina) using Leah Day's paisley design. I'm a bit of a one trick pony, but I really enjoy quilting this design and love how it looks. This was my 1" hexagon case a little over a month ago. There are a few bright hexagons left, but now it's filled with some of my reproduction fabrics for another project. I have decided to try and machine quilt and bind my way through the stack of UFOs that I have. My larger quilt tops are hanging over hangers in the closet, but the smaller quilts and table toppers are stacked on a footstool. They kind of drew my attention when they toppled over and onto the floor. So I guess it's time to work on some of them. I am saving these to practice my machine quilting before moving on to things that I've spent more time on. I enjoy watching the Leah Day and Angela Walters videos to try their machine quilting methods. This quilt will likely end up on the floor in front of my fireplace. If you see a photo, there is a rectangle of ceramic tile in front of the fireplace. Tiki, our cat likes to lay there, and he really enjoys a quilt to lay on. We have a heat advisory here today, so I'm going to sit down and stitch some hexagons. I hope you are finding some time to stitch today, too! Yesterday was our monthly gathering of the English Paper Piecing Addiction Group at Back Door Quilts. Even though there were terrible thunderstorms that rolled through town and the quilt shop lost power, we still had a great time as usual. First is Barb's quilt. I don't remember the pattern, but she changed the design for the sashing. I wish I'd gotten a better photo because the border print and binding are beautiful. Connie is working on a Sue Daley block for her It Takes Two quilt. This is one of Michele's blocks made using the 2 inch octagon wedge from paper pieces.com. I have a package of those wedges and may just have to do one of these blocks. Marlene is working on the cover quilt from Handfuls of Scraps by Edyta Sitar. Her fussy cutting is beautiful. Here are some of her hexagons that will go into the quilt. Here's another. I love this fabric. This hexagon is made from Edyta Sitar's fabric. Lynette is starting the center part of the quilt. Becky has finished piecing her Ode to the 30s pattern by Lori Smith. Sandy has finished piecing her version of Faith, Hope and Love by Sue Daley. The photo doesn't do this piece justice. I love the red centers. One of the girls is actually doing some sewing. The quilt on the left is one of the sample quilts at Back Door. The quilt on the right is an antique that they bought in Shipshewana, IN....probably at Rebecca's shop. (I forgot to ask.) You can find Rebecca on Facebook at Rebecca Harrer Arts and Antiques. Shop samples of Jefferson Star blocks. This is a little quilt by Red Door Designs. This a new pattern by Brandywine Design called Antique Baskets. Linda has made lots of these baskets. There is a plastic template for cutting the pieces for the basket that is sold separately. There are 6 different handle choices which are hand embroidered. They finish at 6 inches. Aren't they cute? I bought the pattern and template and the book Shape by Shape by Angela Walters. 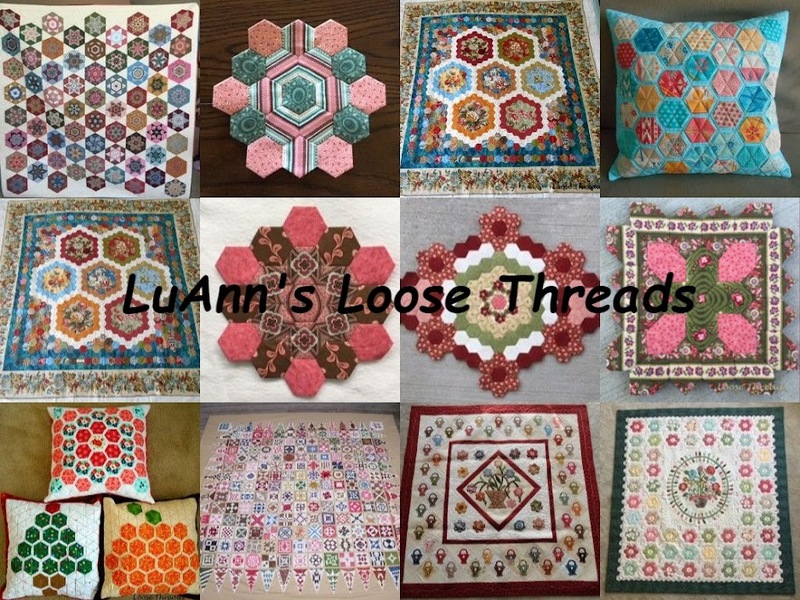 It is a good resource for those that want to try their hand at machine quilting. I hope you enjoyed seeing some of our projects.